In spite of a major debacle in Goa, the Bharatiya Janata Party and Manohar Parrikar had a last laugh. He has staked claim to form the government, with the support of eight non-Congress elected legislators. 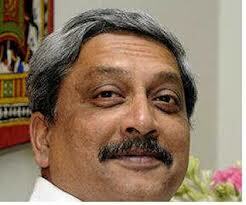 Parrikar said he would shortly resign as the defence minister, in order to take over as Goa CM. Goa this time elected 17 from Congress, BJP 13, MGP 3, Goa Forward 3, NCP 1 and 3 independents. The Congress could not elect its CLP leader till late evening and stake the claim. Meanwhile, Parrikar moved into winning over even Goa Forward, which was initially hesitating to support the BJP. The stand of GF leader Vijai Sardesai and his two legislator colleagues to support the BJP government was strongly opposed by a section of organisational leaders, but in vein. Vijai later told the media that he has joined the government since a clean man like Parrikar would protect the interest of Goa and Goenkarponn. MGP leader Sudin Dhawalikar had already made it clear in the morning that he would support the BJP government if Parrikar is the CM. BJP union minister Nitin Gadkari said they are also in touch with NCP’s sole MLA-elect Churchill Alemao and another independent Prasad Gaonkar.